I’ll be honest with you guys right now. Sometimes I feel like my excitement over small, somewhat irrelevant things can be really annoying. And I say this because I know that’s probably how today’s post might come across, so let me just apologize in advance for my annoying-ness, ok? Good. Now, moving on. 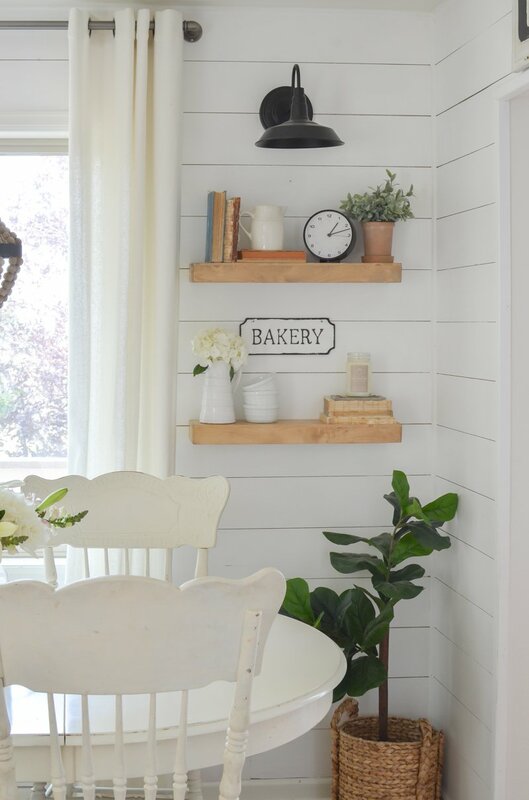 You guys, I found the perfect farmhouse style floating shelves for our breakfast nook and I’m SOOOOOO EXCITED. Not only are they exactly what I’ve been looking for, but they’re real wood and less than $30. BOOM! We got them installed this weekend and I seriously cannot believe how much I love them. On a scale of one to ten, I’m at a twelve. Really. They’ve given our breakfast nook the pizazz it was desperately needing and I’m just tickled pink about the whole thing. I styled them up and snapped a few photos to show you guys today! 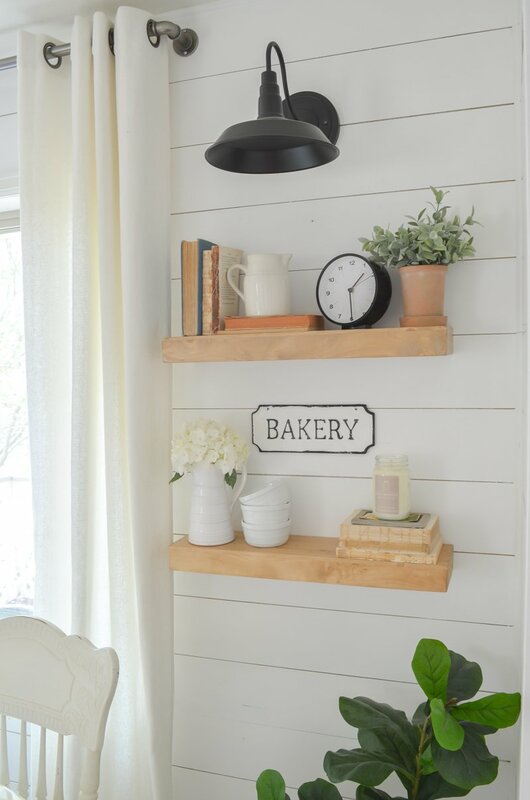 Seriously, aren’t these the most perfect floating shelves ever?! I might be overly excited about them, but that’s because they remind me of the floating shelves in our master bathroom, which my father in law was kind enough to make for us several years ago. Remember those?! You can see them here. Those shelves took him a decent amount of time and energy to make, so when I stumbled these look-alikes for less than $30 I was absolutely thrilled. 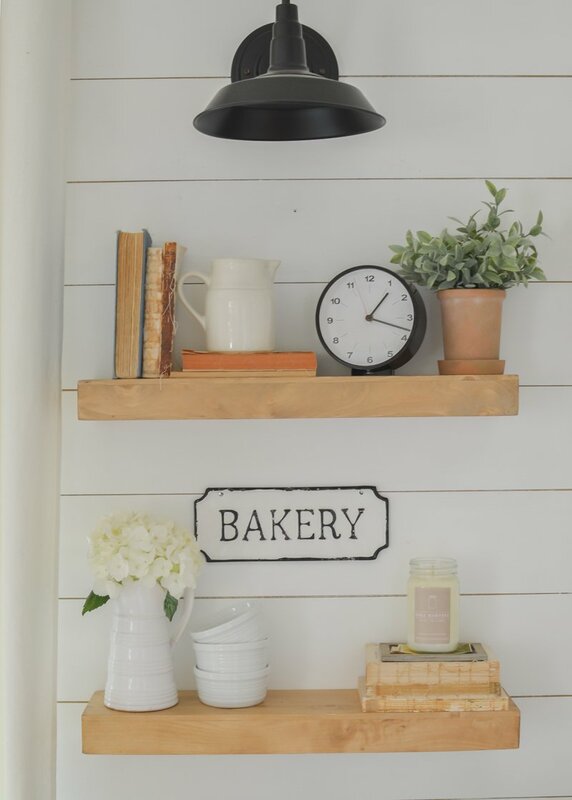 I styled this for a really simple look with a few old books, one of my favorite candles, this cute little black clock, and a couple of small white pitchers. 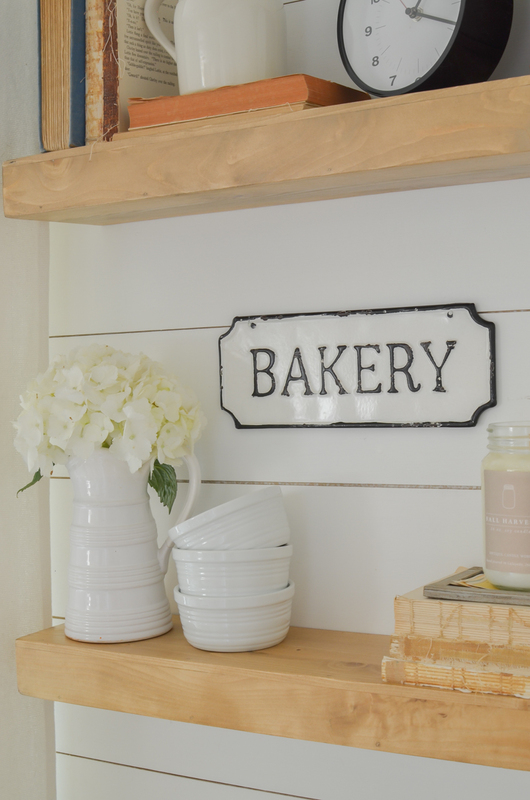 I also picked up that adorable bakery sign at a local shop recently and I just love it. And if you’re curious about that light, it’s actually not even hardwired. It’s just screwed to the wall. Who says faux lights can’t be decor, too?! The awesome thing about these shelves is that they can be stained or painted to match any style. I’ve been loving the weathered wood look, especially with the white backdrop and pops of black, so I wanted to leave them natural like this. But if you’re more into a darker look you could stain them or even paint them to whatever color you like. 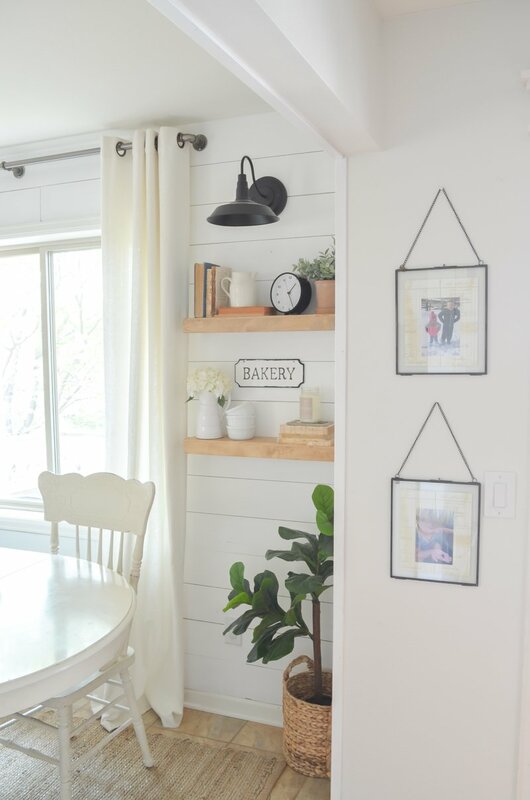 And I gotta say, even though I love a good DIY project, I think these ready-to-go shelves are a no-brainer if you’re looking to add floating shelves in your home. They also come in a longer version too. These would be great stacked on top of each other over your couch, in your bathroom, kids rooms, dining room, etc. Anywhere your little heart desires! Quick Tip: The key to installing floating shelves is to make sure you’re screwing them into studs on the wall. Even through our faux shiplap we were able to use a stud finder that helped us locate the stud edges in the wall. This is SO important because if you just screw them in willy nilly without a stud, they won’t be sturdy enough to hold anything. Plus they’re probably end up falling off the wall eventually and then you’ll be really sad. So finds those studs first!! Those are the cutest! They really compliment your dining area and all of its accessories. Wow I love these!! And I can’t believe they’re from Target! I need these in my life now! Right?! I don’t know if they’re new or if I’ve just been living under a rock. But Target wins again!! These are gorgeous. I also get excited about the little things. Thanks for sharing! You are absolutely right…..those shelves are stunning!! Of course, I don’t expect anything but stunning from you! 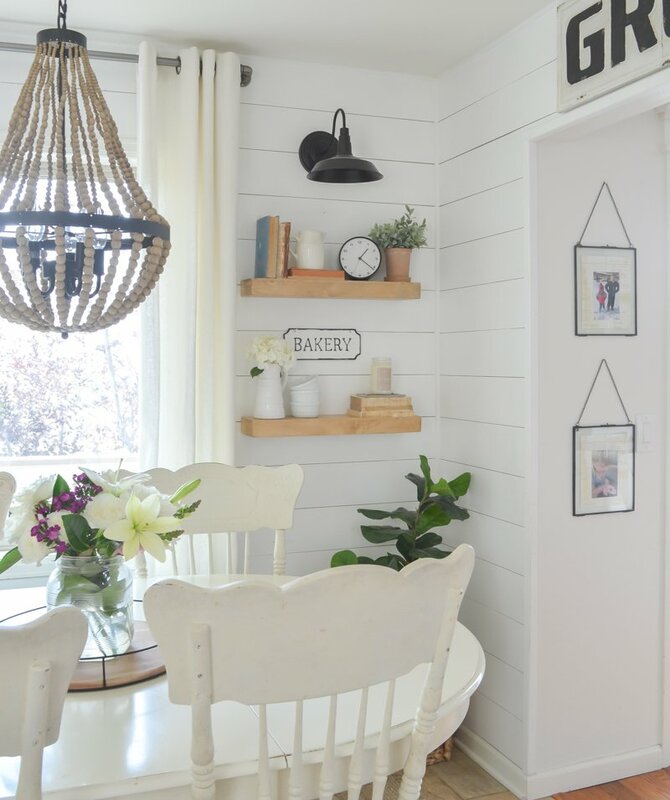 🙂 The breakfast nook is so pretty and delightful!! I’m glad you shared this space with us! Aw thank you Dana, you are always so kind!! Do you mean that smaller white pitcher on the top shelf? That was actually just a random find at an antique shop! If that’s not what you meant just let me know. I actually had one in there for a while but I took it out because we never used it! Pretty! Would you ever consider doing a follow up review on the puck lights? I see you have them in a few places in your home now. You know, to be honest I didn’t really end up using them ver often. So I took them out of our lights! But they did work well when we had them turned on. HELLO – WHERE DID YOU PURCHASE THOSE PICTURE HANGERS WITH CHAINS! as always love your blog THANKS! 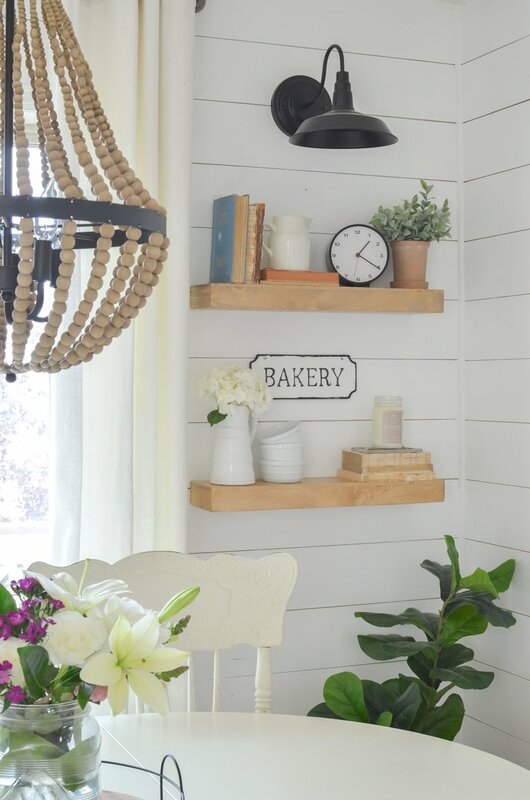 I love these shelves and I love the way you styled them. 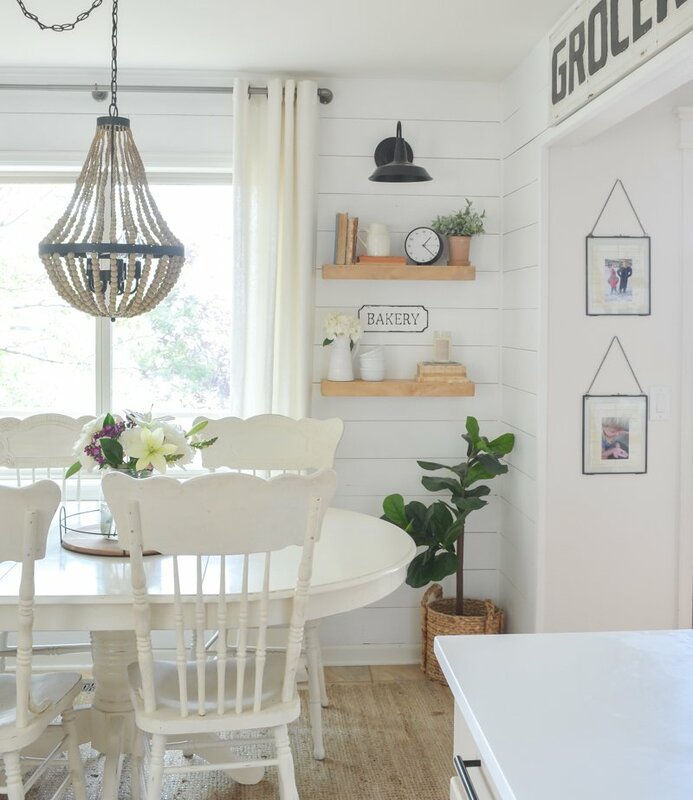 I like the natural wood look with your white too. We are putting up shelves in a couple of places in our little house, so your timing with this story is perfect for me. Oh yay!! Good luck hanging your shelves Kathy. They are perfect for that space! I’m such a vignette person, so always love seeing your small design ideas! I love the small design details too Brenda. It’s always fun to put little things together! I’m going to do this in my office. Love the black light above. Didn’t you do a story or tutorial on them? Are they hardwired? Yes I did! They aren’t hardwired. Just screwed into the wall. I had a puck light in there for a while but i took it out because I never turned it on. Love the floating shelves! I would be giddy too! 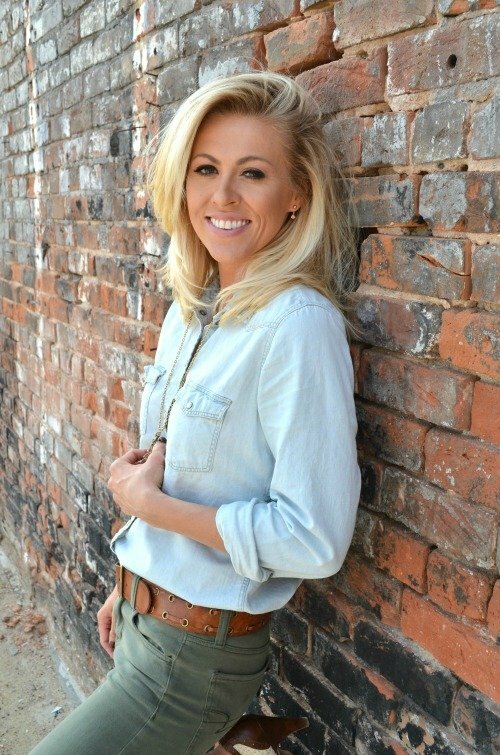 And the way you styled them is as usual… AMAZING! And you just gave me a great idea for an obvious blank space with that faux light! Fabulous floating shelves. I also love how and where you have them displayed in your home. Thanks for tis helpful post.